Posted on Tuesday, January 15th, 2019 in Kenya. We’re flying at almost 200km/h over Turkanaland and I’m leaning out of the helicopter to get a better view of the desert landscape. The windgust is hot, like a pizza oven, and it’s blasting my eyeballs. I’m doing my best to capture the scenes with my camera but there is too much to look at, let alone photograph. The land seems too big, the sky too large for human vision. It’s as if my brain’s CPU can’t process quickly enough I’m seeing. So I press the button on my camera and hope for the best, shooting off hundreds of shots automatically. The landscape below us looks apocalyptic in its sheer emptiness and harshness. It has a strange, almost malevolent indifference about it. The renowned writer AA Gill once wrote of the Kalahari: “The great thing about the Kalahari is that it hates you. It wants you dead”. I get what Gill was trying to say, but I reckon Turkanaland simply couldn’t be bothered about humans. It’s too busy dealing with more important things. Here on the Great Rift Valley, Africa is being ripped apart by tectonic forces beyond human comprehension. The Nubian and Somali tectonic plates are moving inexorably away from each other. In a few hundred million years, East Africa will drift off into what we call the Indian Ocean. And Turkana land is ground central for these violent geological forces. Against this timespan, the human species seems laughably insignificant. But I’m not finding any of this funny. By now it’s over 40 degrees Celsius and the heat of the desert air is intense. I’m feeling nauseous. The pirouetting movements of the chopper and the burning winds don’t make me feel any better. I soon forget about it all. 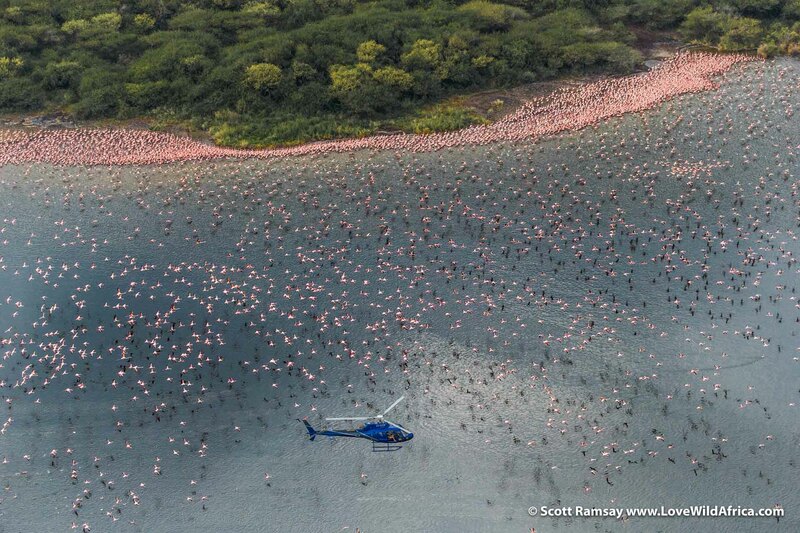 Suddenly there are flamingos flying all around our chopper. Thousands of them. 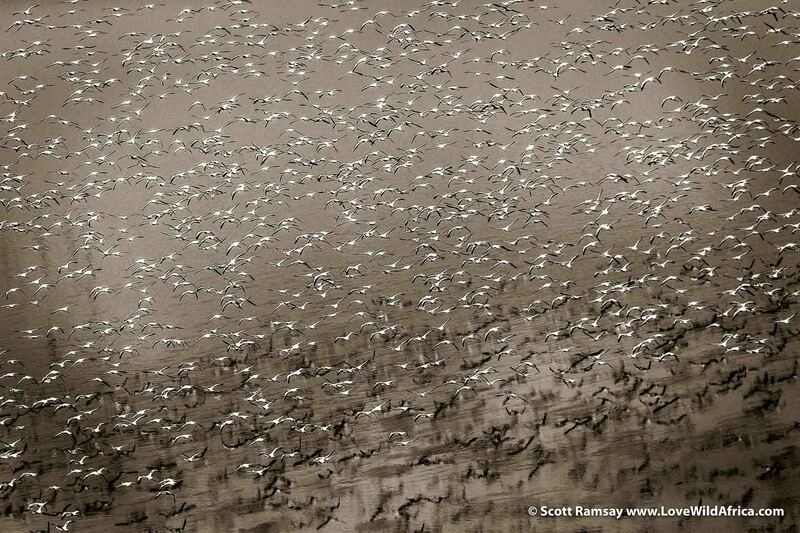 They are soaring over Lake Logipi, one of many shallow, caustic lakes in this netherworld of Kenya’s northern desert. The birds turn this way and that, swooshing currents of pink and white. 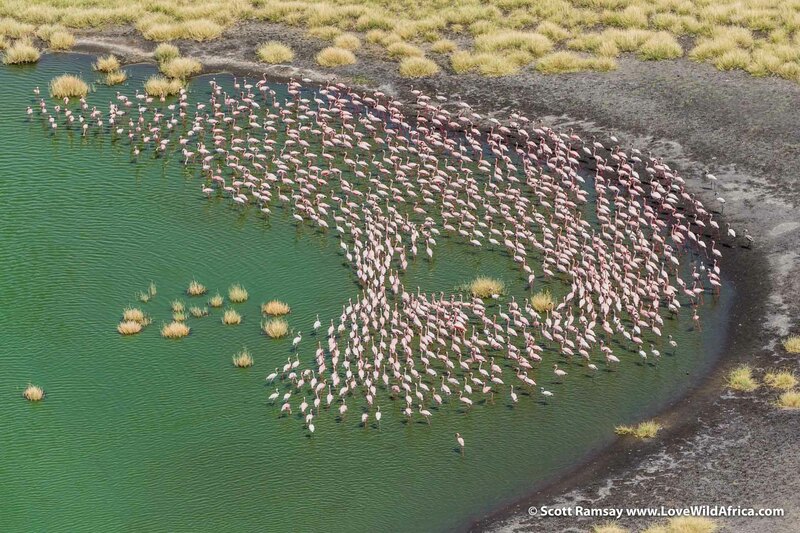 We fly low over the lake and thousands more flamingos rise into the sky, wave after wave of them. By now my nausea seems to have morphed into some sort of natural high and it all starts to feel a bit trippy, like some bizarre dream that leaves one baffled and bewildered. You know those deep dreams when on waking you wonder what the hell that was all about? 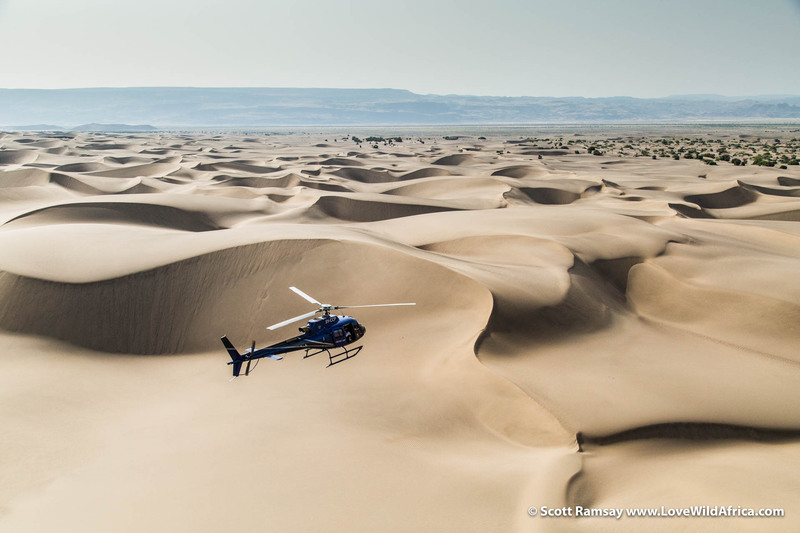 Flying over Turkanaland in a chopper is like that. For most foreigners (including me, until recently), Kenya seems to be a land of lush savannas and huge herds of wild animals. Go to the Maasai Mara in July and August for the wildebeest migration, and you’ll see one of the world’s most impressive natural events. But that’s only telling half the story of this diverse country. In fact it’s barely a quarter of the story. 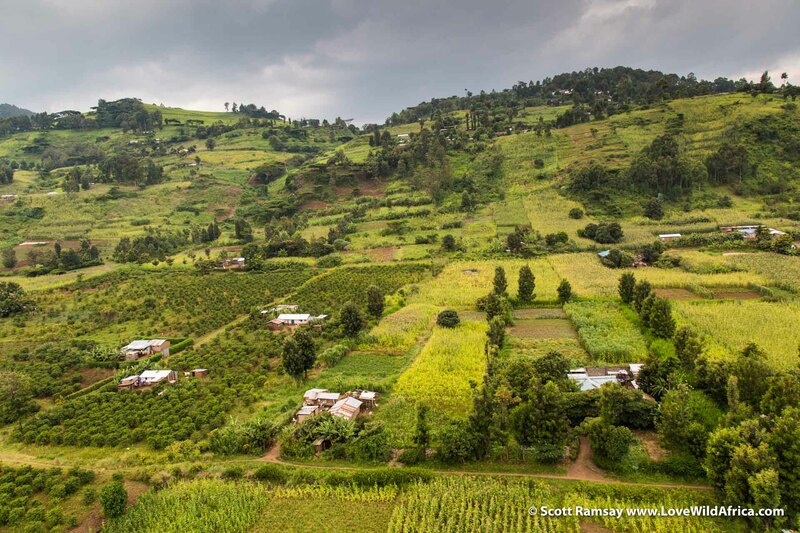 Most of Kenya – more than half – endures semi-arid or desert conditions, and receives between just 200 and 400 mm of rainfall annually. If you look at a precipitation map, the whole of the northern half of Kenya is semi-arid or desert. To the northwest is Sudan, to the north is Ethiopia and to the north-east is Somalia. It’s understandable why most tourists on a first-time visit prefer going to the well-watered southwest of the Maasai Mara, where the climate is more gentle and the wildlife plentiful during the famous migration. That’s where most safari companies operate, and that’s the stuff that gets promoted endlessly in the tourist brochures. But it’s also what millions of people have already seen, and it’s a cliched – albeit important – story that’s been told countless times by wildlife TV film crews. 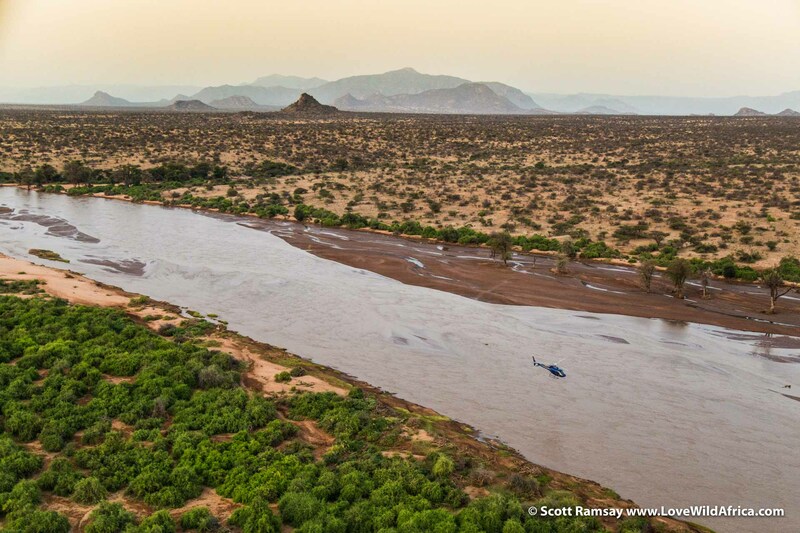 If you want to experience what Kenya is really about, if you want to gain a more holistic appreciation for it’s character, then you should head north into Turkana land. If you do, then it soon becomes clear why most tourists steer clear of this region. It is simply too challenging for most humans to live in, or even visit for extended periods. 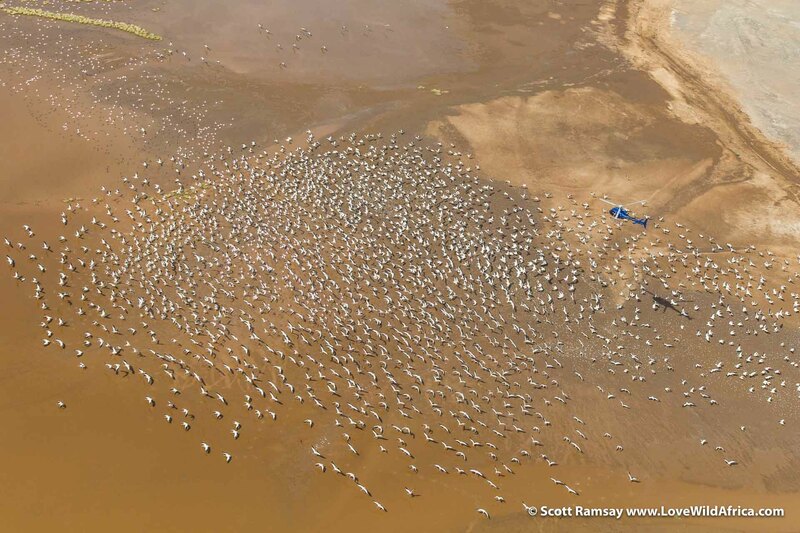 Turkana land is the yin to the Mara’s yang. Take a look at the photos below, and you’ll understand why. 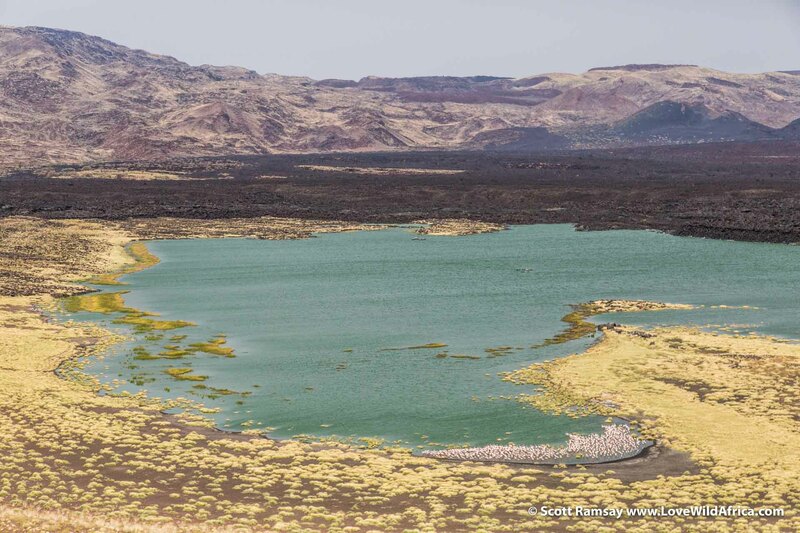 The Turkana, Rendille and Samburu people claim this turf as their territory, but the majority of the place is uninhabited. The climate and landscape are too ferocious, even for these famously resilient people. The hard way - or the easy way? Intrigued? 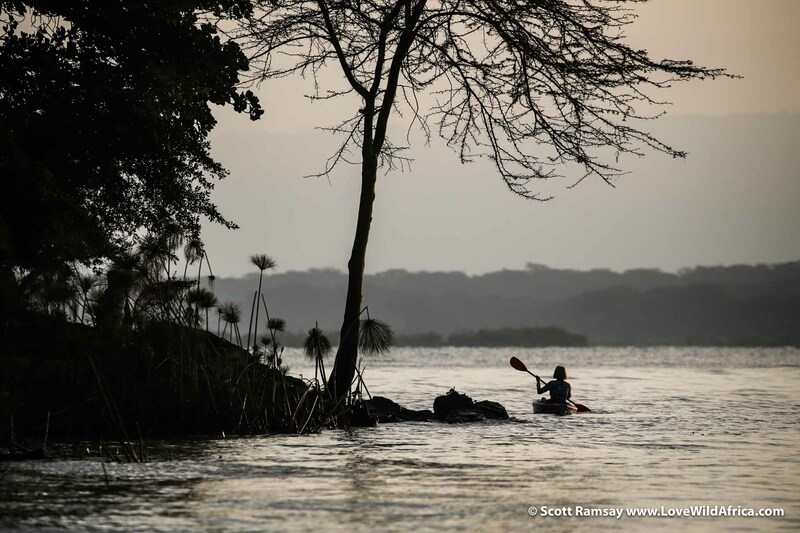 Then you can visit this netherworld of Kenya the hard way – or the easy way. The hard way is possible, of course, but it will take you several weeks of driving terrible roads in a convoy of 4×4 Land Cruisers, an inordinate sense of humour (or maybe none at all would be better), plenty of water and supplies (which means there’s less space for cold beers), lots of good luck and a willingness (or naivety) to endure the usual unpleasant surprises of travel in rough and sometimes lawless areas of Africa. Or, you can do it the easy way. 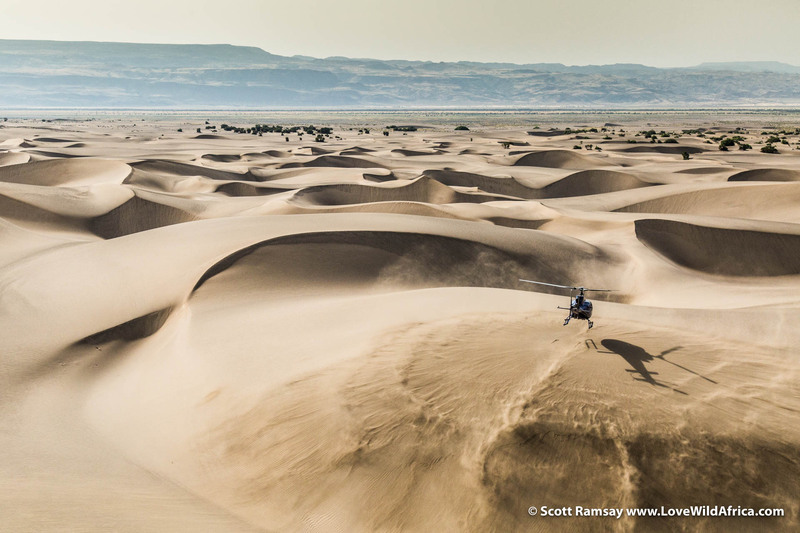 Flying in a helicopter, it will take just a day to travel almost 1 000kms over some of the most astounding landscapes in Africa. 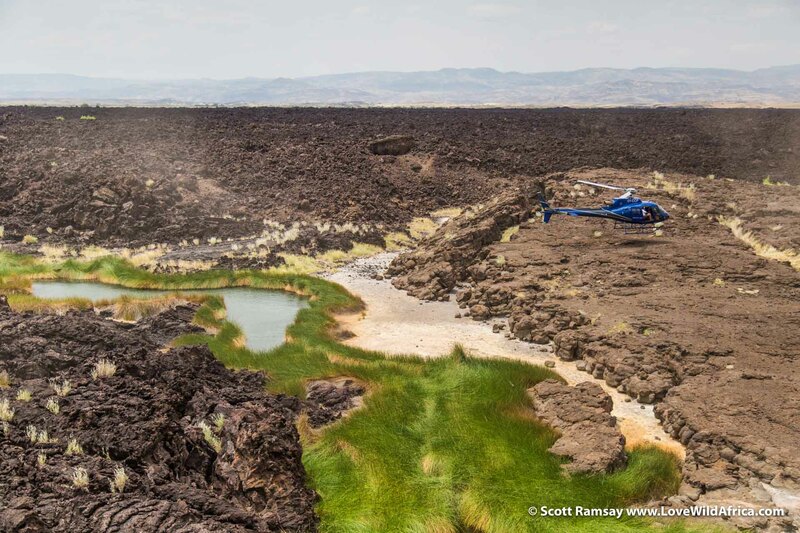 You’ll also be landing in places where almost no modern humans have been, simply because the mountains, the gorges, the craters, the volcanoes and the soda lakes are impossible to access by vehicle or even on foot (unless you’re a wandering Turkana warrior with seriously big balls, which I’m guessing most of you are not). 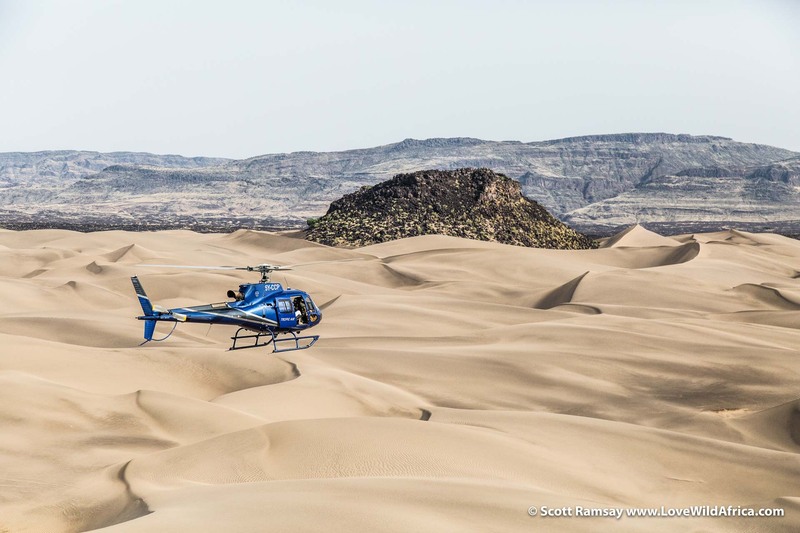 Mikey and Tanya Carr-Hartley from The Safari Collection and Specialised Safaris offer various helicopter tours around East Africa, but the day trip into northern Kenya is one of Mikey’s favourites, because it is so different to anything most people have experienced on a safari. If you’re looking for a day to remember, this is it. As a photographer I’ve been lucky to see some very special sights on the continent. 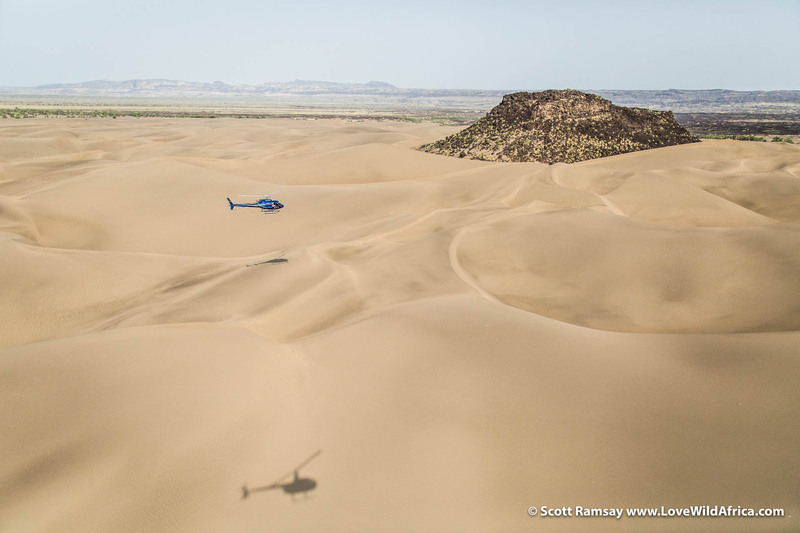 I’d say that this helicopter trip into northern Kenya was the most intensely visual day I’ve ever had. There were so many moments during the day when I felt like I was in another realm, a place that didn’t feel like planet Earth. Maybe it was the heat, maybe a bit of dehydration from the hot winds, or maybe it was the sheer scale of the place. It was also one of the most physically demanding days I’ve had. 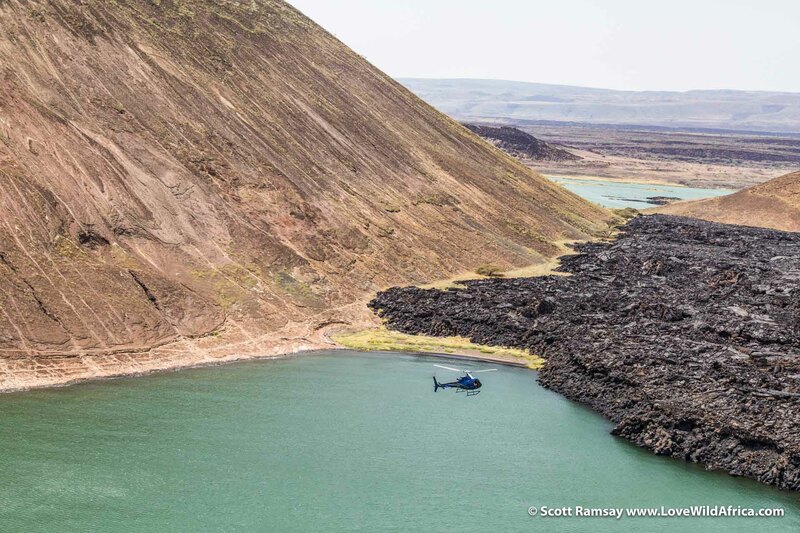 I know that sounds weird, because we were sitting in a chopper most of the day, but because pilot Andy Belcher had taken the doors off (for photography and filming), we were exposed to the intense heat and pounding winds for 10 hours. 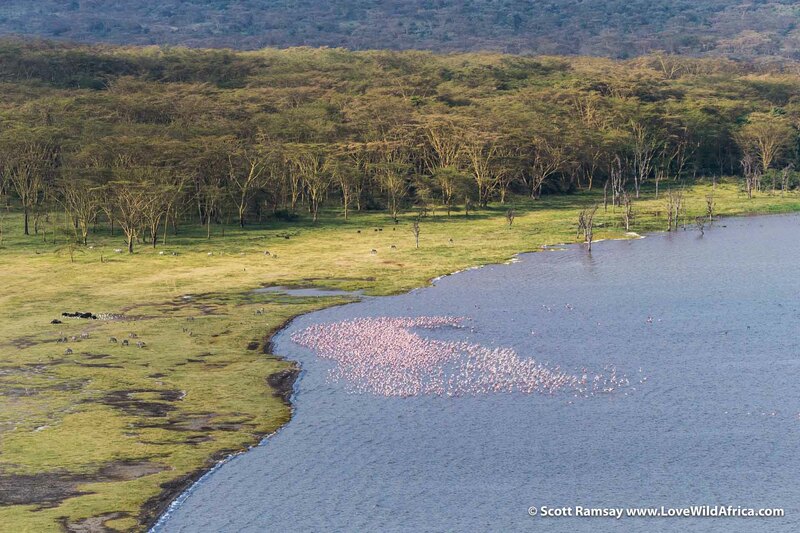 At the end of the flight, when we landed at Lake Naivasha, I felt like my brain had been barbequed. But I’d do it again tomorrow, if I could. 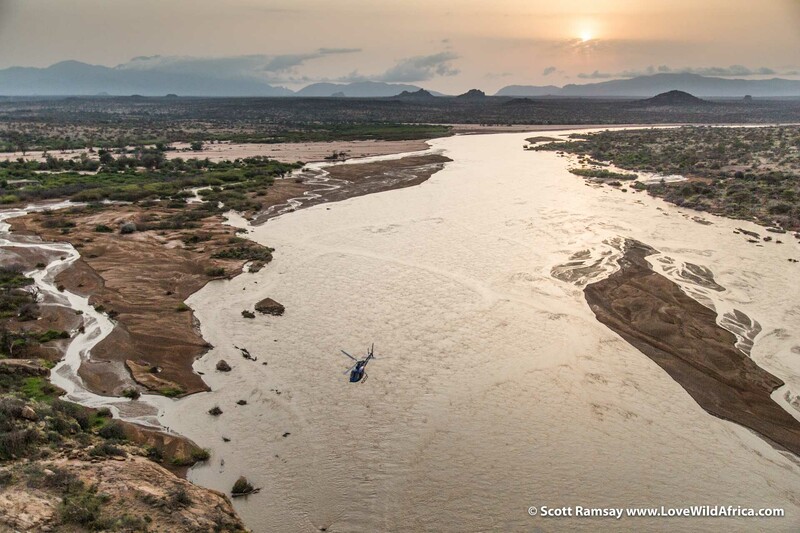 Leaving Sasaab Lodge before sunrise, flying over the Ewaso Ng’iro River. Sunrise in Samburuland, leaving Sasaab Lodge behind and heading northwest into Turkana land. 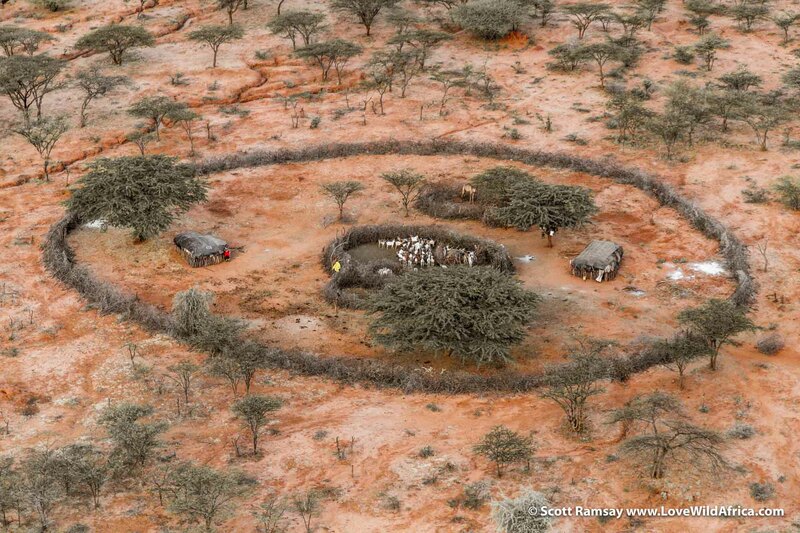 Samburu homestead. Note the inner cirlce of thorn bushes, protecting the livestock from predators. 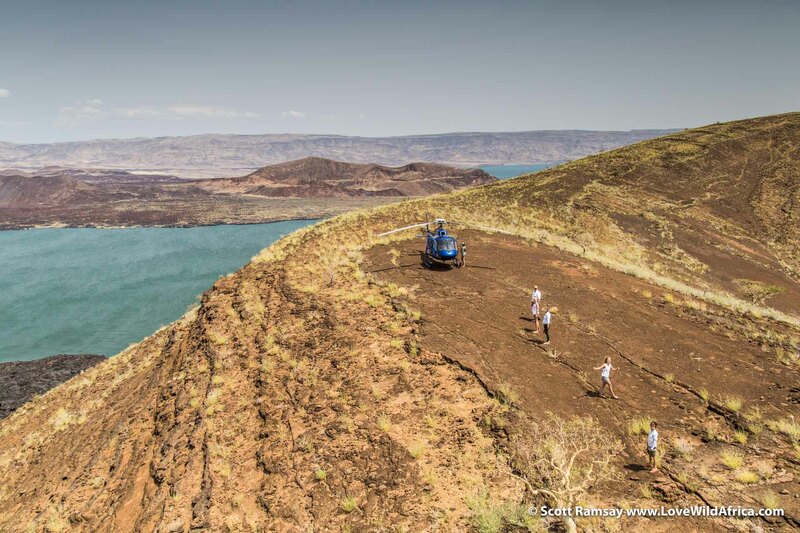 Also note the erosion on the landscape from overgrazing (too many people, too much livestock, not enough productive land, and unpredictable rainfall). According to government census counts, the Samburu population has more than tripled in the past 30 years, from 67 000 in 1984 to 224 000 in 2009. Cattle numbers have increased similarly. 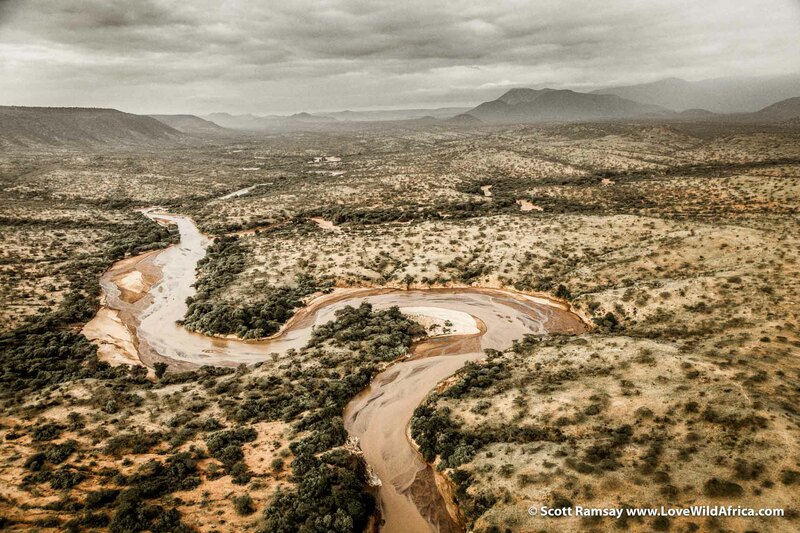 Soon after leaving Sasaab, the landscape became devoid of obvious signs of people. Entering the Hudu Valley, a series of gorges formed by red volcanic ash deposited by millions of years of eruptions in the Rift Valley. 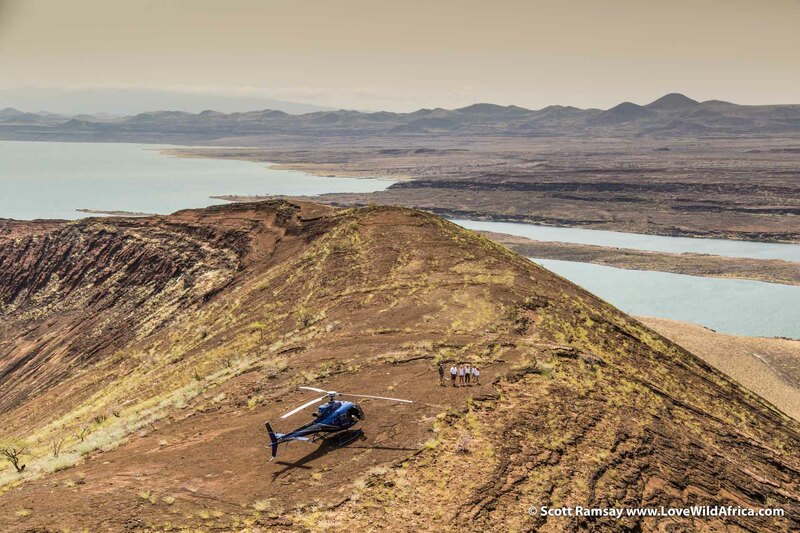 This is the stage of the trip when you’re glad you’ve got a highly skilled chopper pilot on board. 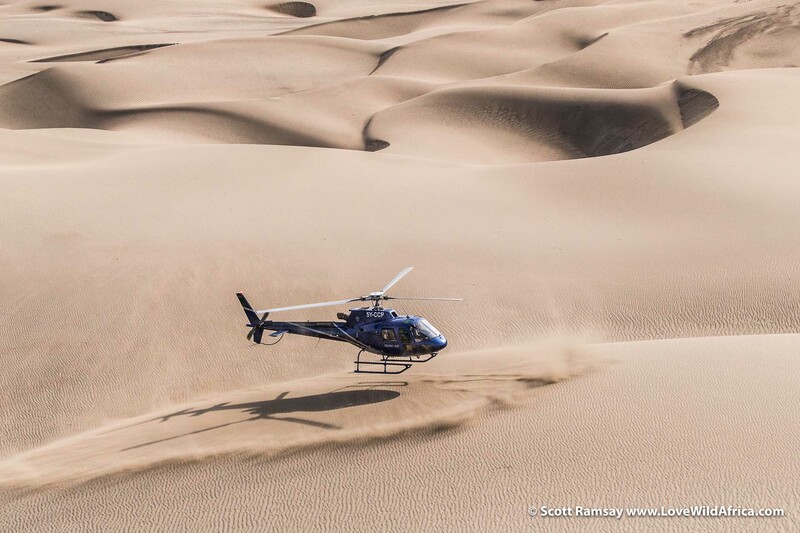 Andy Belcher was flying me and film maker Austen Johnson from Etched Space in a small Robinson R44, and Sarah Snell was flying Mike and Tanya and their kids in this enviably powerful Eurocopter. A scene of out Airwolf, that 80s TV show that made every boy want to be a helicopter pilot. 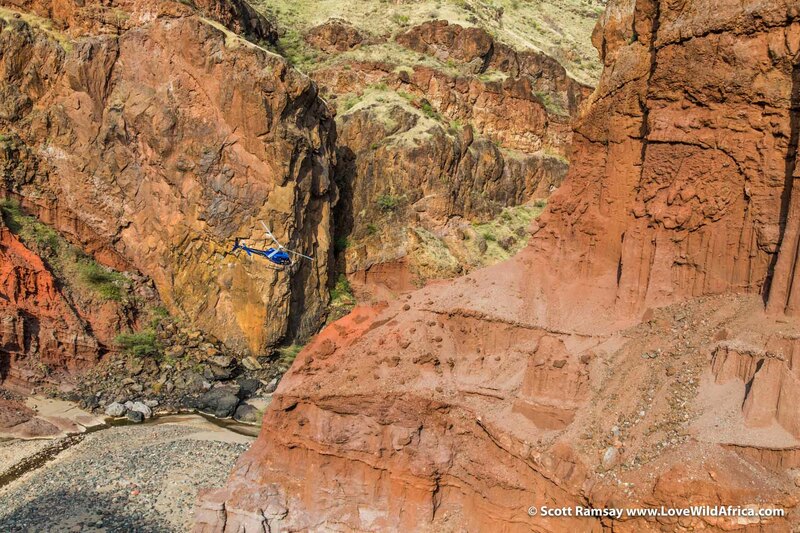 The red cliffs and towers of the Hudu Valley is one of many places that would be otherwise almost impossible to see, if it wasn’t for a helicopter. There are no roads, and no tracks to walk…there’s no reason for herders to bring their livestock in here, and so it remains unseen by most humans. 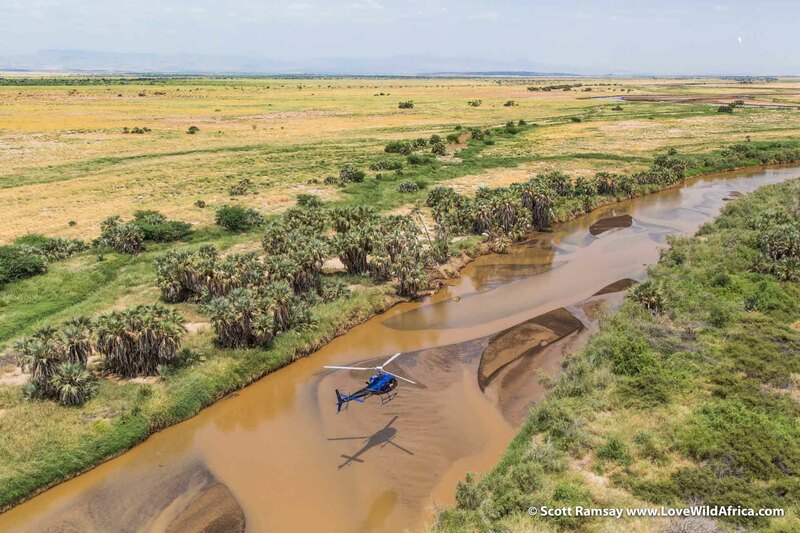 Crossing the Suguta River, leaving Samburuland and entering Turkana land…though of course, the land is oblivious to such distinctions. 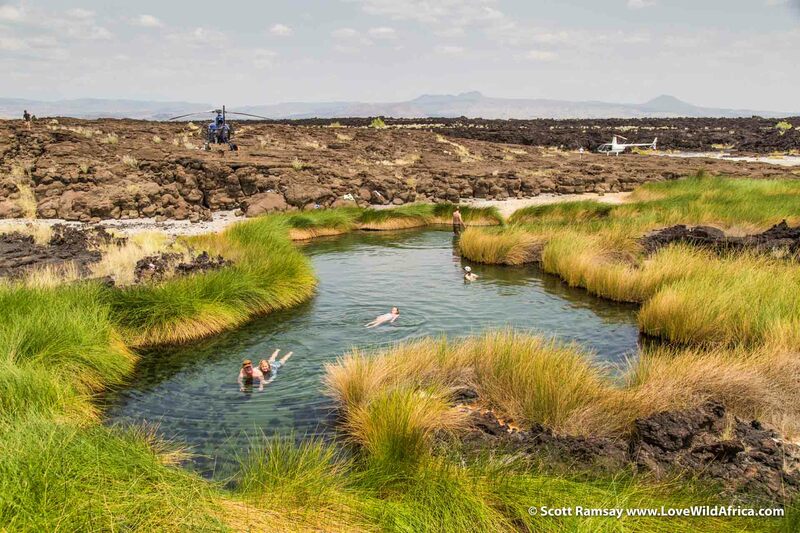 The Suguta River flows northwards towards Lake Logipi, and originates from hot springs around Mount Silali, a dormant volcano to the south. And then there was nothing but sand and rock. 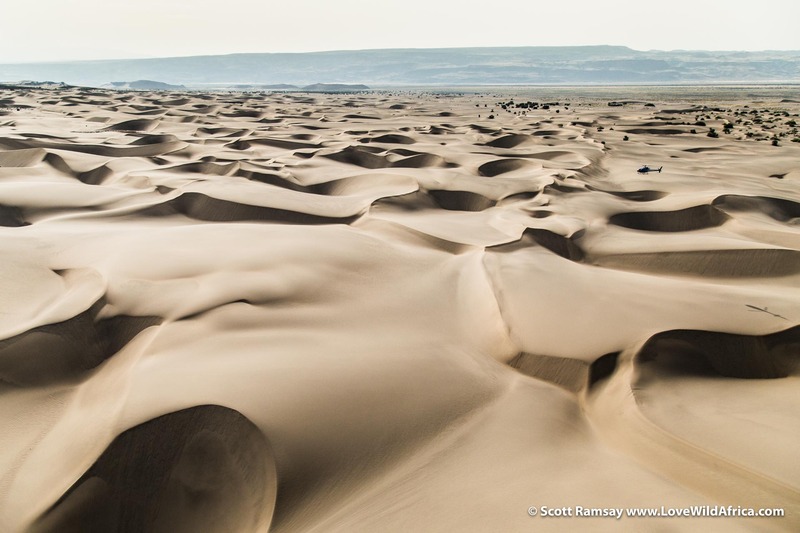 The Suguta Dunes were formed when Lake Suguta dried up about 8 000 years ago, and the relentless winds carved these dunes. No wonder the lake dried up. Today the area receives less than 200 mm of rain annually, but evaporation is between 3 and 4 litres per year. 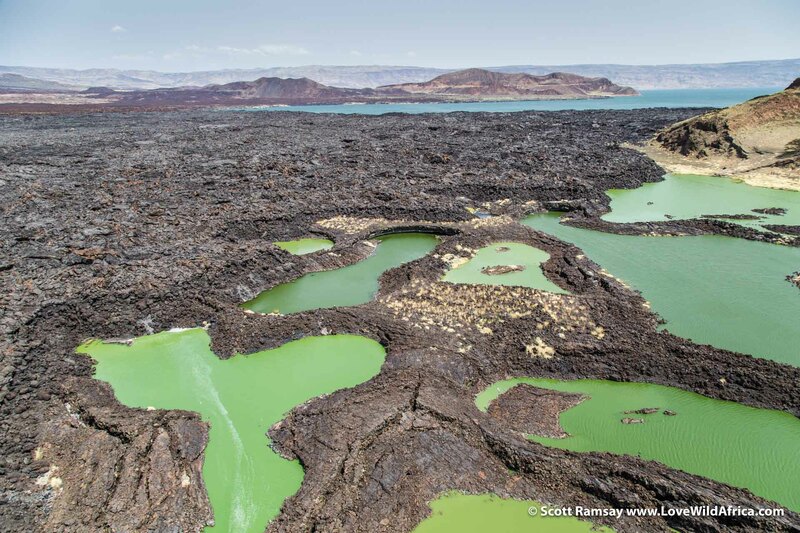 On first glance, I would never have guessed this scene was in Kenya…Namibia, North Africa, Sahara…yes, but Kenya? 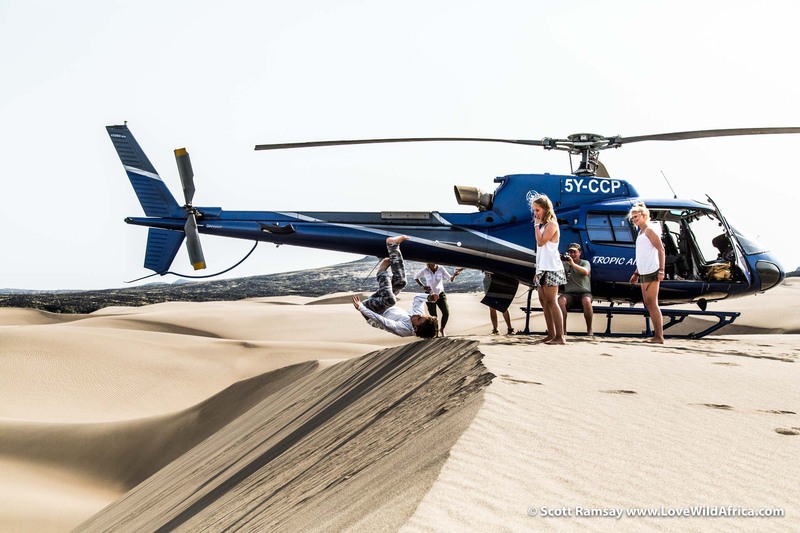 Sarah Snell of Tropic Air lands the Eurocopter on a sand dune, while we watch them from our little Robinson R44. 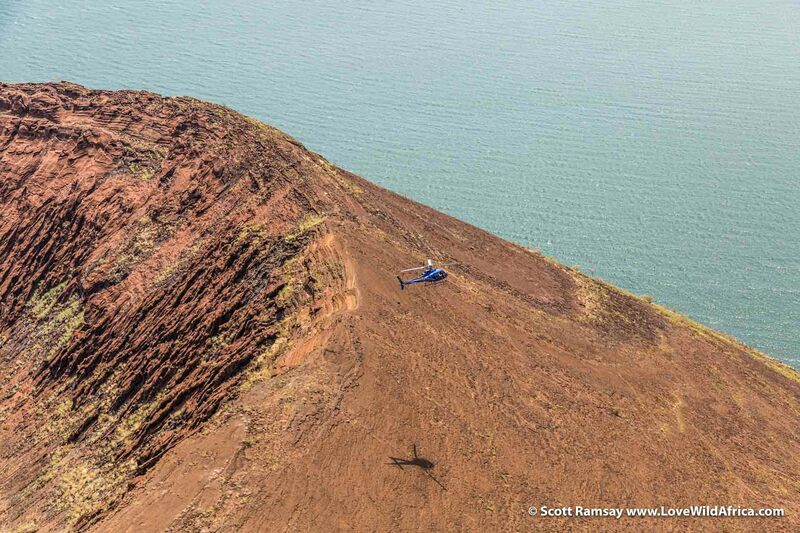 Another view of the landing…the freedom of travelling by helicopter is addictive…but of course, it doesn’t come cheap. 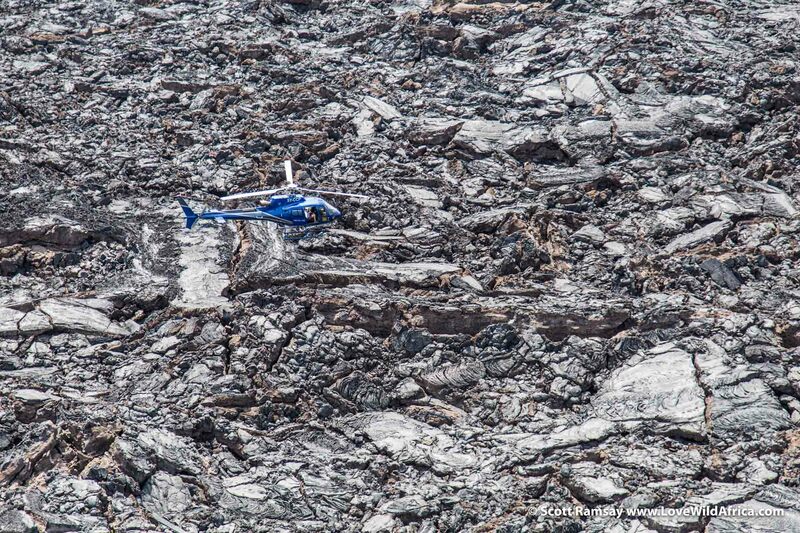 Can you spot the chopper? Africa – and Kenya – is a big place. 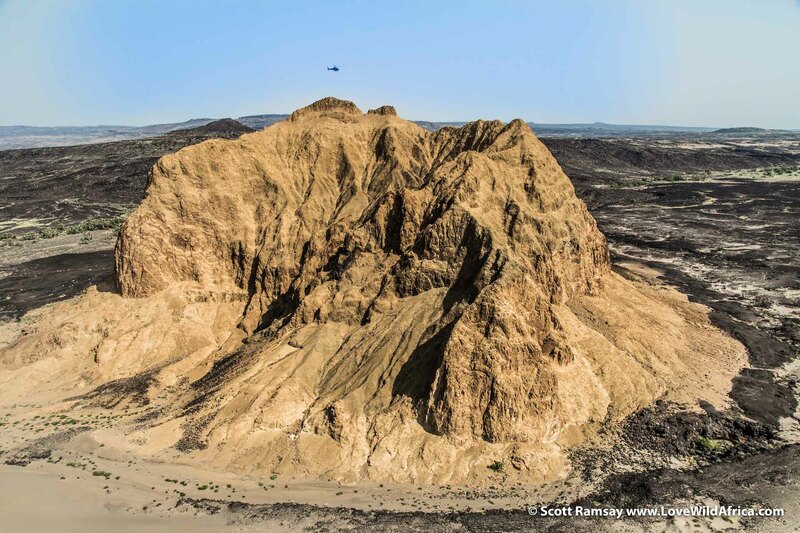 North of Suguta Dunes, we flew past this massive rock mountain. 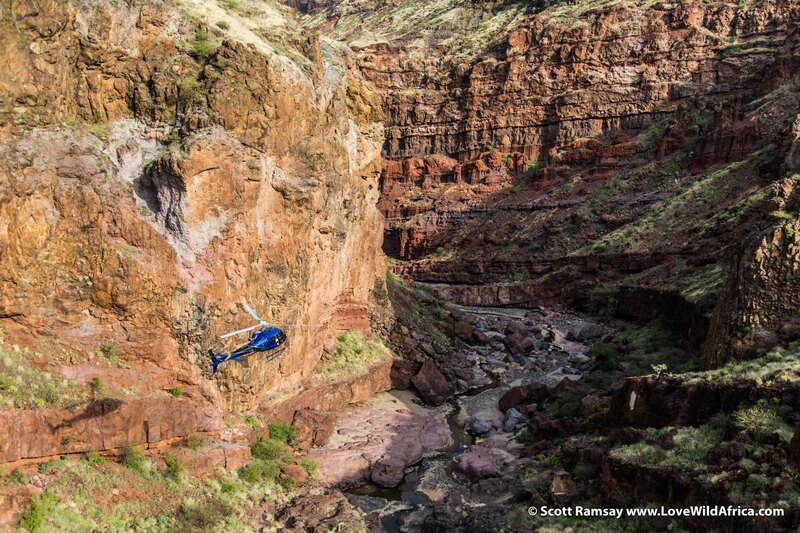 The Eurocopter provides some perspective and scale to the image. 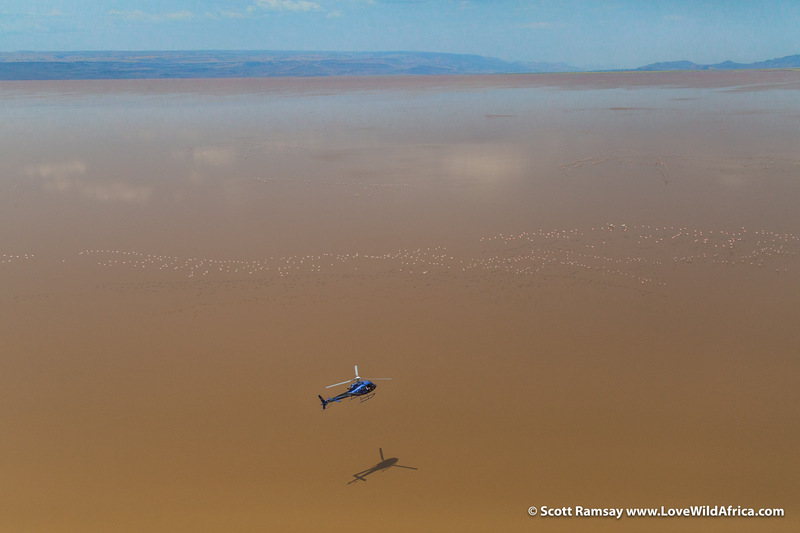 Flying over the southern end of Lake Logipi, we came across our first flamingos…the contrast between these beautiful birds and the harsh landscape is bizarre. But what a sight! 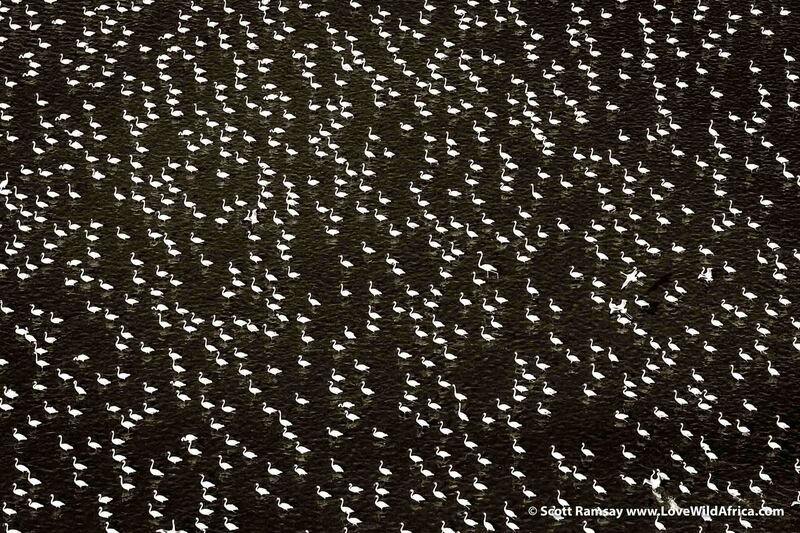 Pelicans and more pelicans…this is the Great White Pelican species. They are huge birds, weighing up to 15 kgs, with wingspans up to 3,5 metres, only second to that of albatrosses. 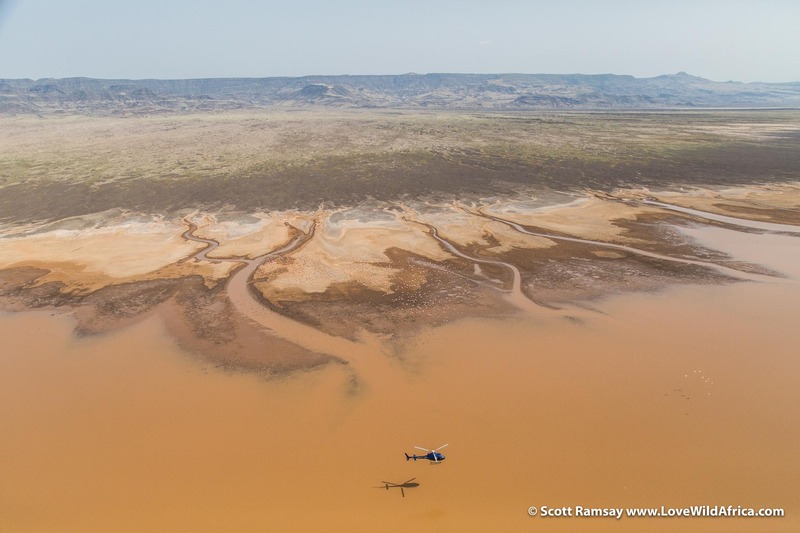 Kenya has one of the largest populations in Africa, but there’s a real concern that their population is falling, because of the drying up of the lakes in the Gregory rift, which are generally shallow. A combination of excessive water use from the rivers that flow into the lakes, and an increasingly arid, hot climate, means that many of the lakes are getting smaller and smaller. This not only affects water volume and fish numbers, but also leads to an increase in the toxicity levels of naturally-occuring minerals like zing, mercury and copper. I’ve got a new collective noun for a group of flamingos…a hallucinogen of flamingos…or maybe a strawberry milkshake of flamingos. These ones are soaring over Lake Logipi. 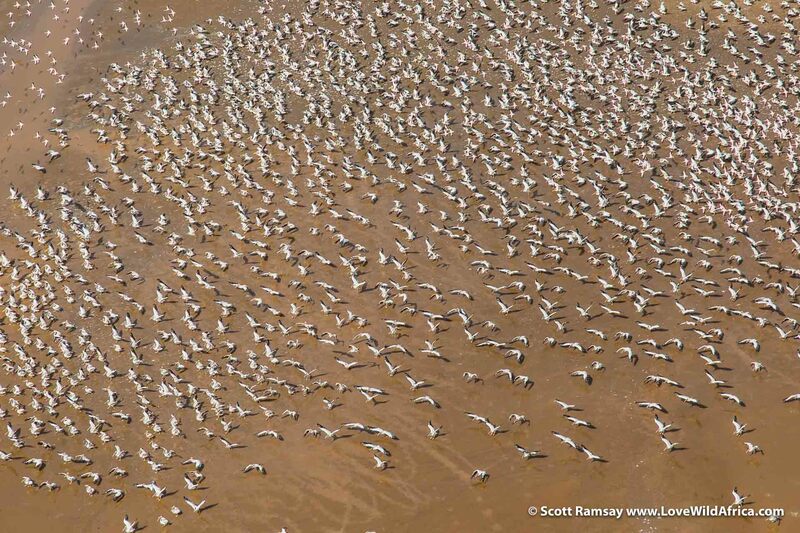 Arriving near Lake Turkana, we came across this flock of flamingos in one of the smaller lakes to the south. 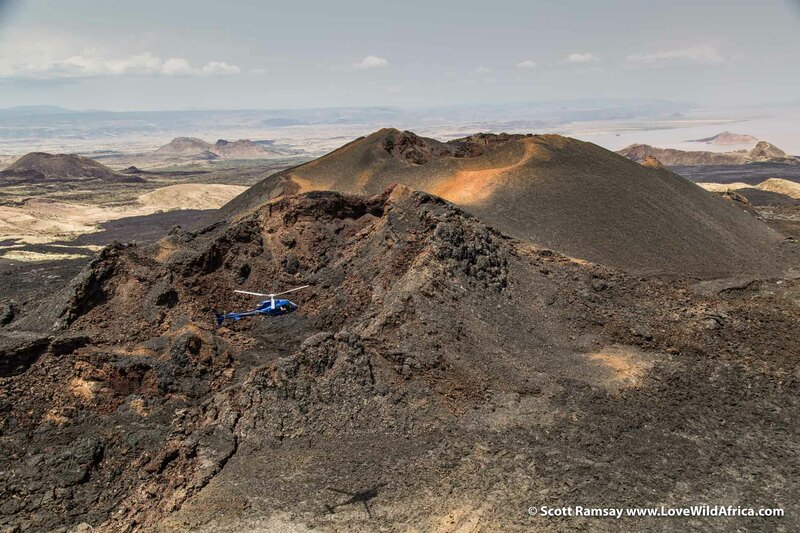 Note the black rocks of the lava flows from Nabiyotum Crater. Mikey and Tanya and their kids (with Sarah Snell as pilot) landed on top of Nabiyotum Crater before us…what this photo doesn’t show is the gale force wind that was pumping our little Robinson R44 into hell and gone…pilot Andy Belcher did a great job to land us safely on top of the crater a few minutes later. 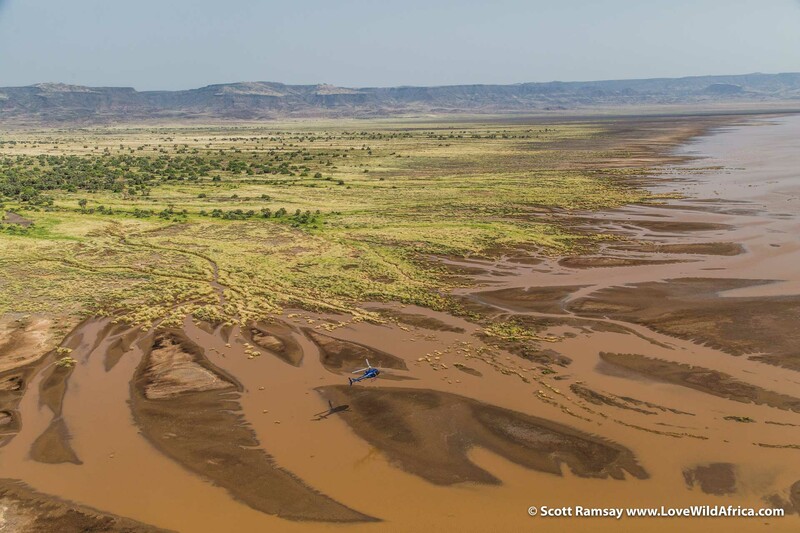 This area of Kenya has some of the highest wind speeds in the world…there is a huge temperature differential between the intense heat of the land and the cooler waters of the lake. 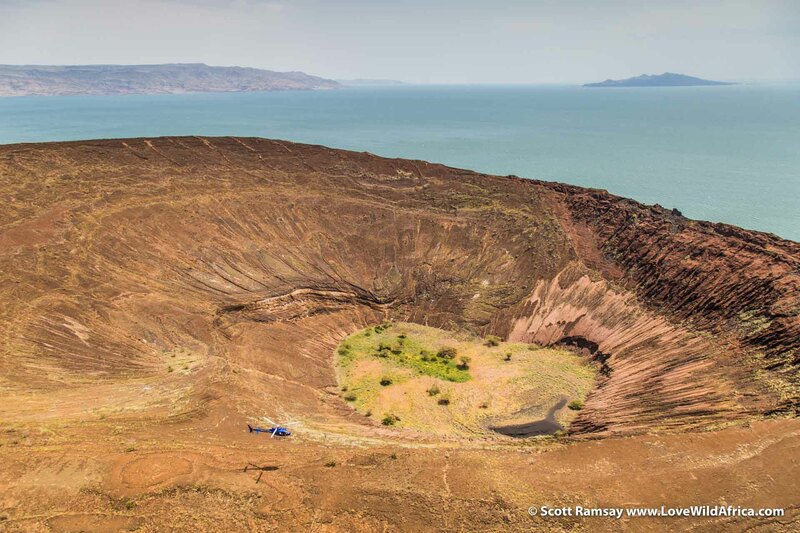 Looking north towards Lake Turkana, with chopper on top of Nabiyotum Crater in the foreground. Another photo for perspective. This place is so massive that if I used my wide angle 16mm lens, you wouldn’t be able to see the Eurocopter…so I zoomed in slightly. 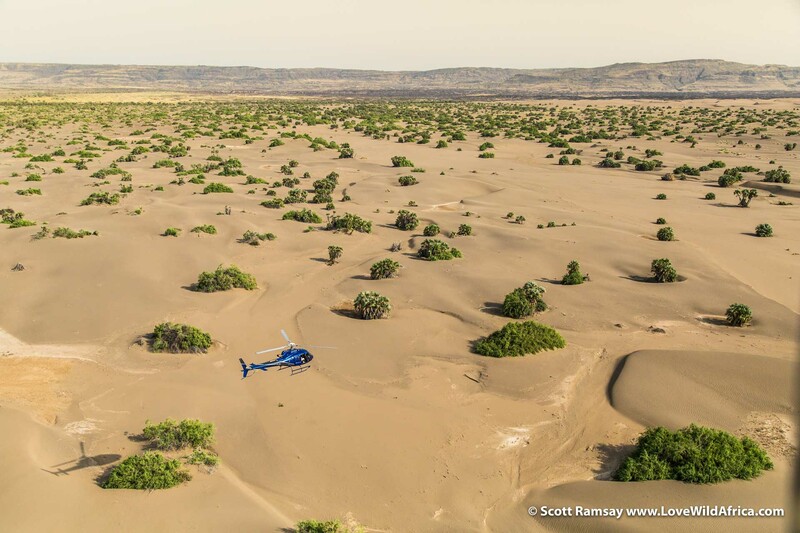 It’s amazing to think that just a few million years ago, this harsh desert region around Laka Turkana was once a well-watered marshland that hosted some of our earliest of human ancestors, dating back 4 million years. Paleontologists consider this area one of the richest in Africa for fossils of early human origins. 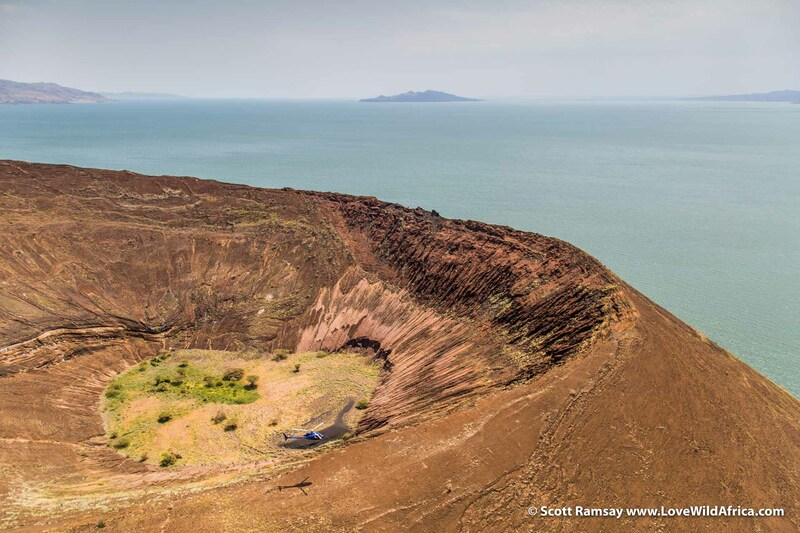 It was around Lake Turkana that many of the most famous early human fossils have been found…and continue to be. 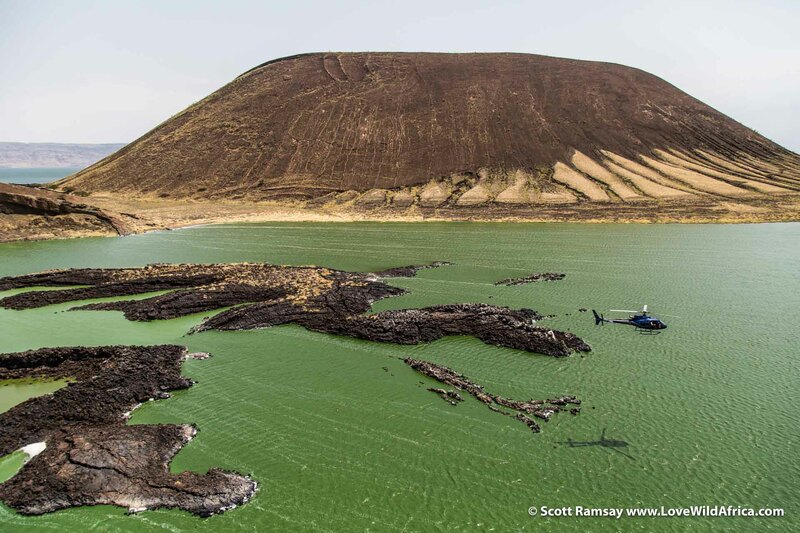 The giants of East African paleontology – like Meave and Richard Leakey, and Komoya Kimeu – made groundbreaking discoveries on the edges of the “Jade Lake”, now known as Lake Turkana (and once known as Lake Rudolf during colonial times). Um, where we gonna land? Are we in Kenya? Or Mordor?! When I look at this photo now, it feels like it’s from a previous life…note the surface of the lake, whipped up by the gale force winds. 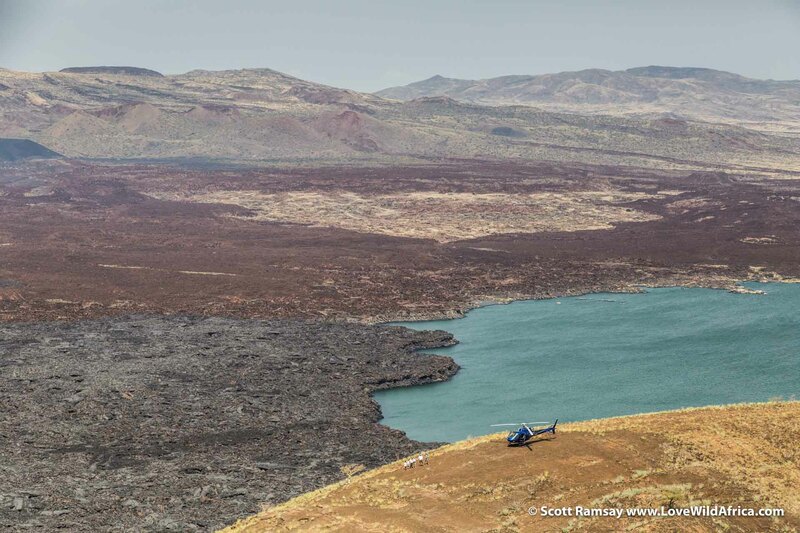 Heading back south again towards Lake Logipi, flying over the lava fields of Nabiyotum. 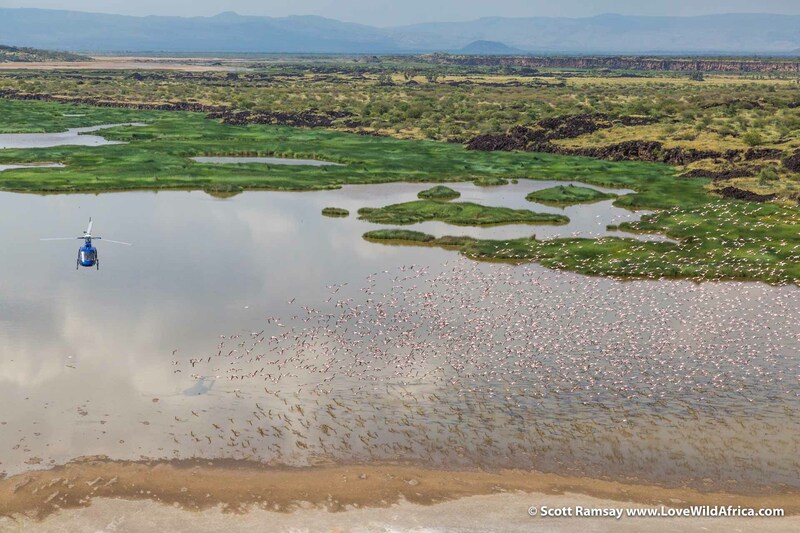 The rift valley soda lakes – like Lake Logipi – are highly saline and alkaline, and toxic to most animals, except flamingos, who thrive by feeding on the microscopic cyanbobacteria alga. 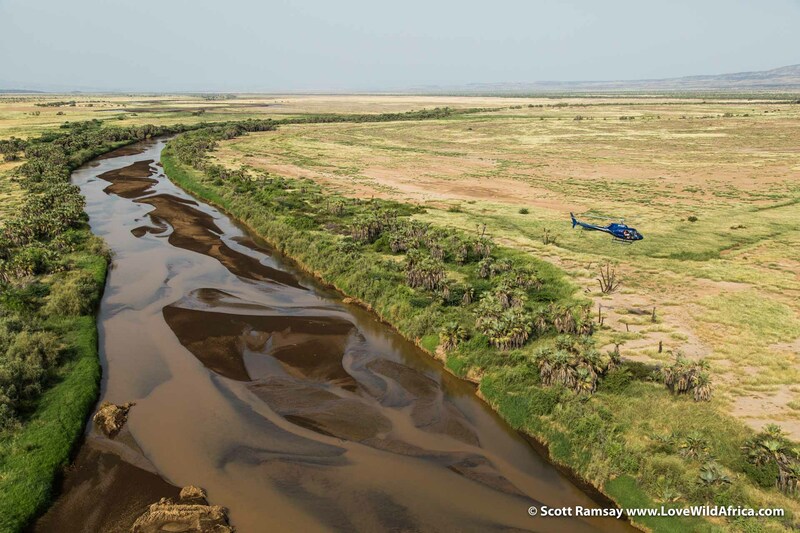 Flying along the course of the Suguta River, heading towards Lake Bogoria and Lake Naivasha. 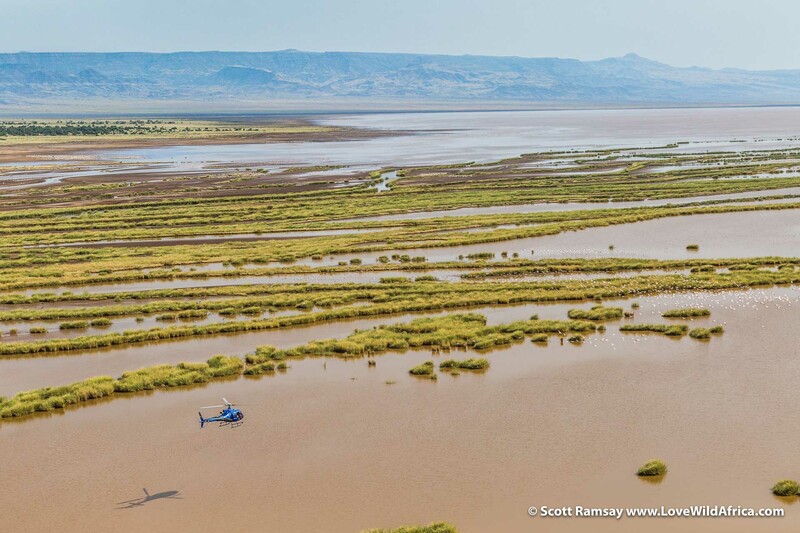 Finding our landing spot near the springs in Suguta Valley. Definitely the most remote and certainly most bizarre swimming spot I’ve ever visited. The water is crystal clear, and contains endemic species of cichlids. The water is also slightly alkaline, and feels a little soapy. But it’s nowhere near as toxic as water in a lake like Nakuru, whose water can shred skin off a human. 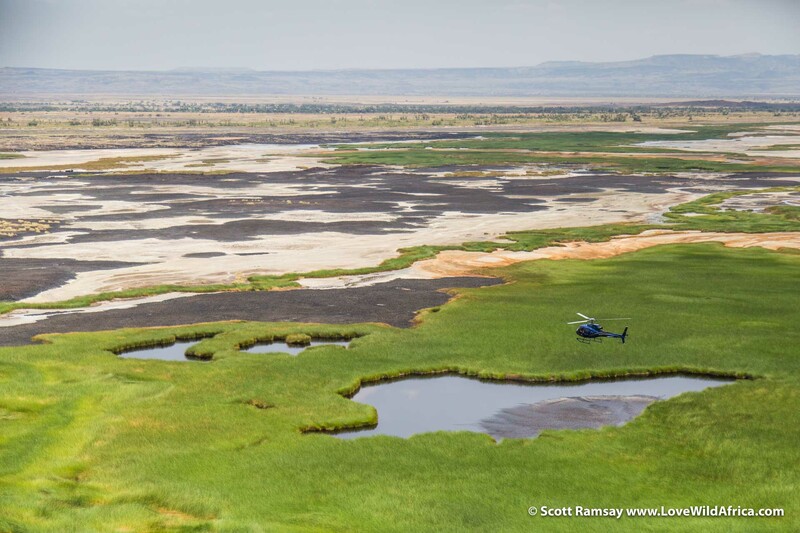 Continuing our journey south, flying over the green marshlands near the relevantly-named Croc Pools, where we did see some sizeable reptiles patrolling the waters. 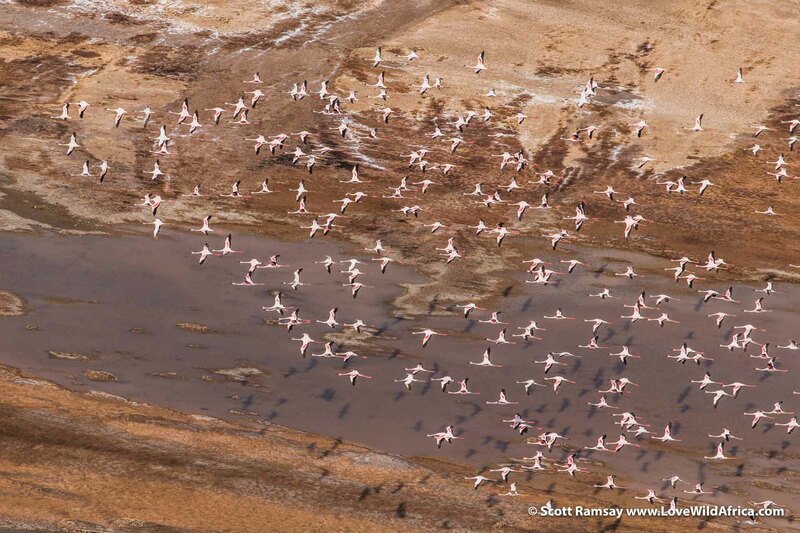 A few more flamingos…just south of Croc Pools. 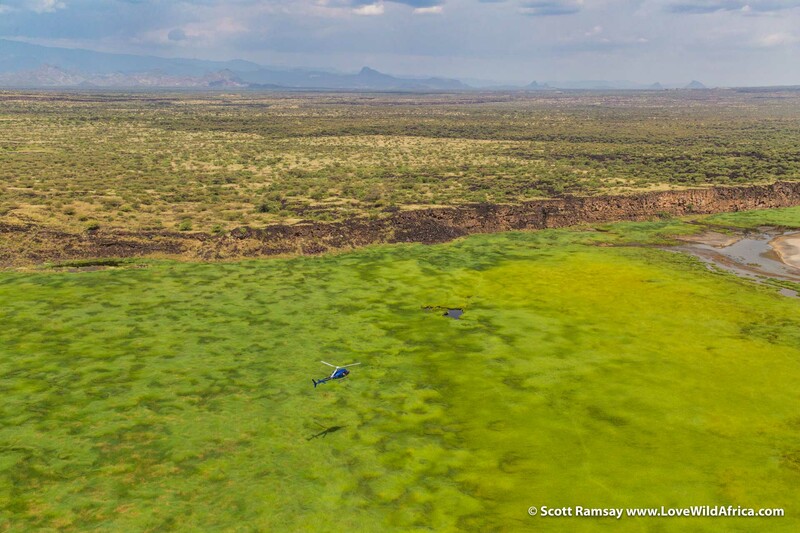 Perhaps my favourite sight of the day…flying over Lake Bogoria, and a welcome return to the colour green. 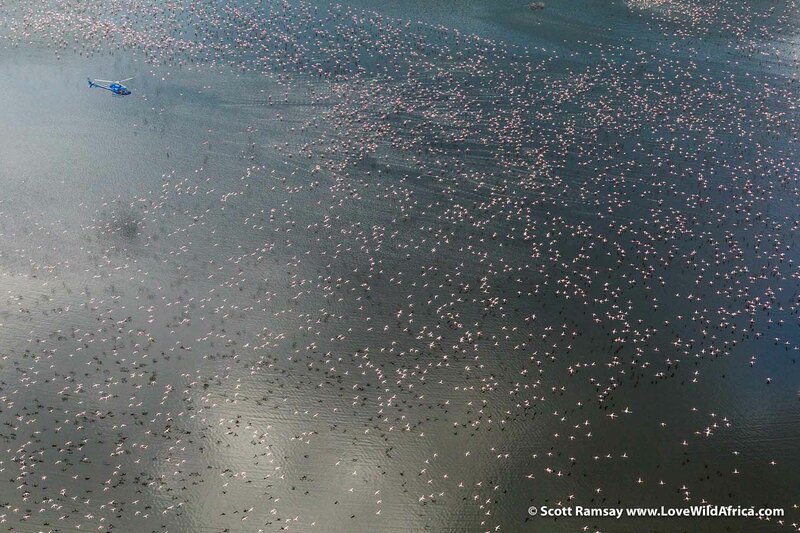 And of course, those thousands and thousands of pink dots are lesser flamingos. 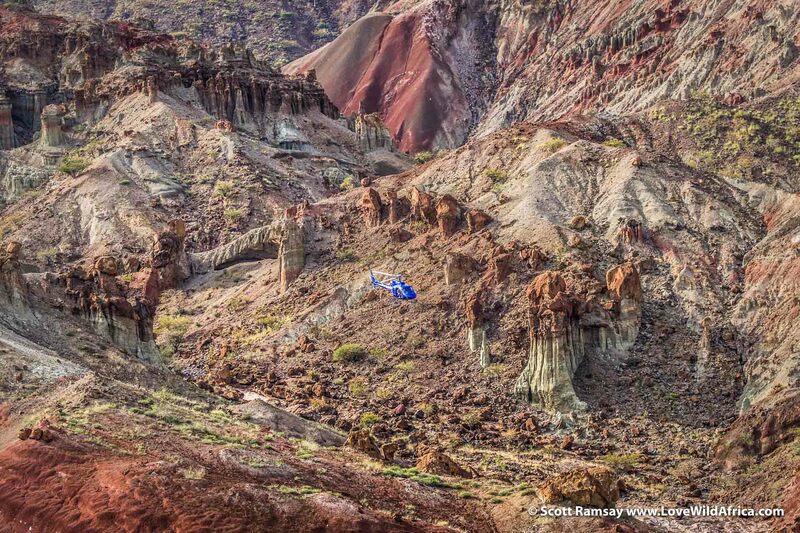 Can you spot the blue chopper? 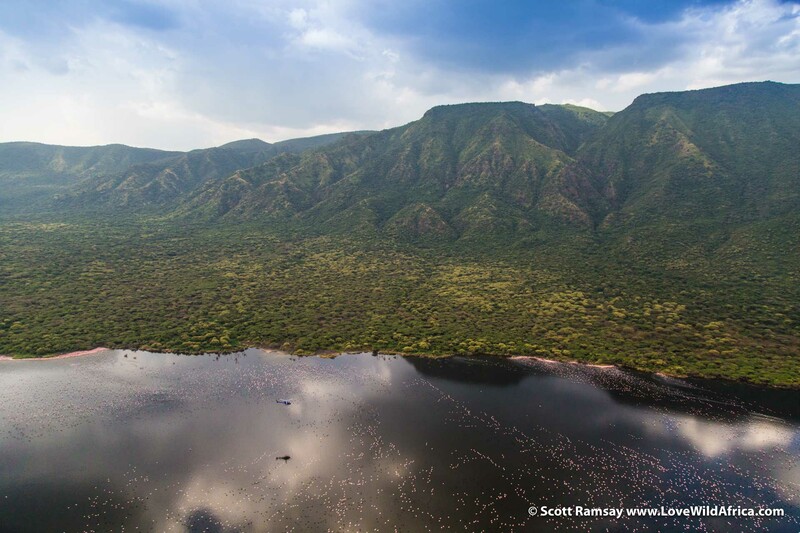 Flying with the pink fairies over Lake Bogoria. 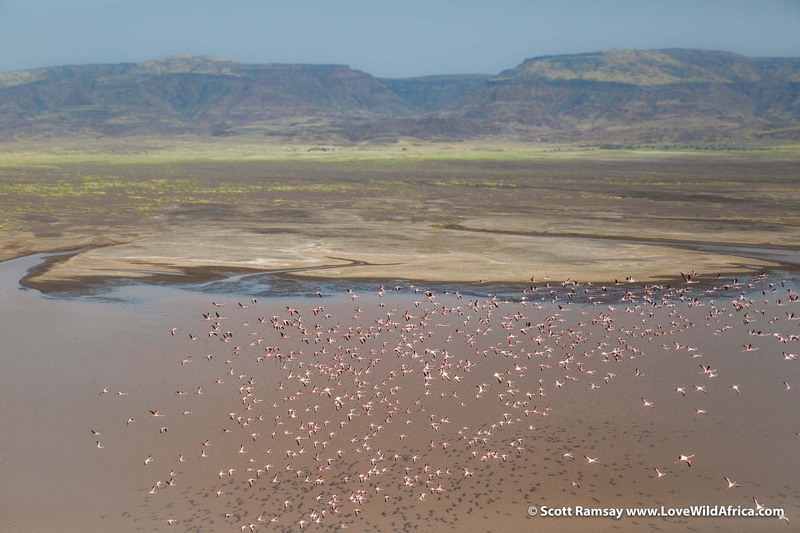 Closer up to the lesser flamingos…Lake Bogoria is a key locality for the species, along with Lake Natron in Tanzania. 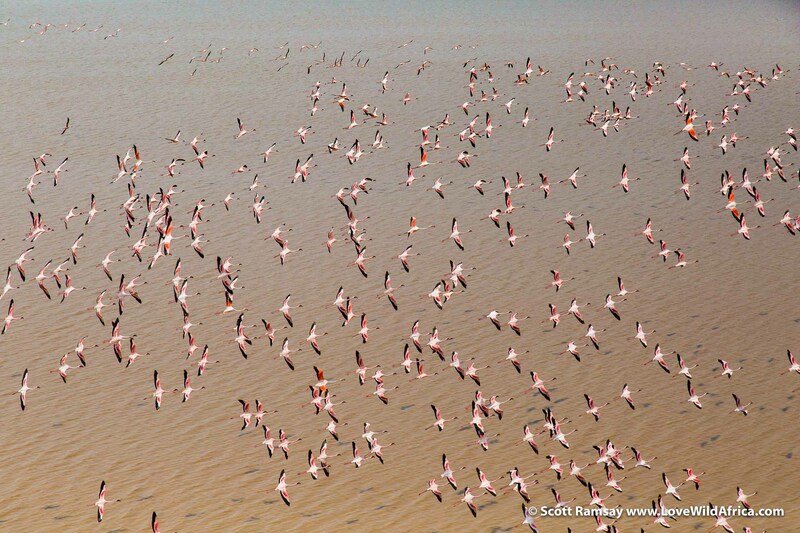 The mass groupings of flamingos provides important advantages…including the calming of waters in the centre of the group, making feeding on the algae easier. 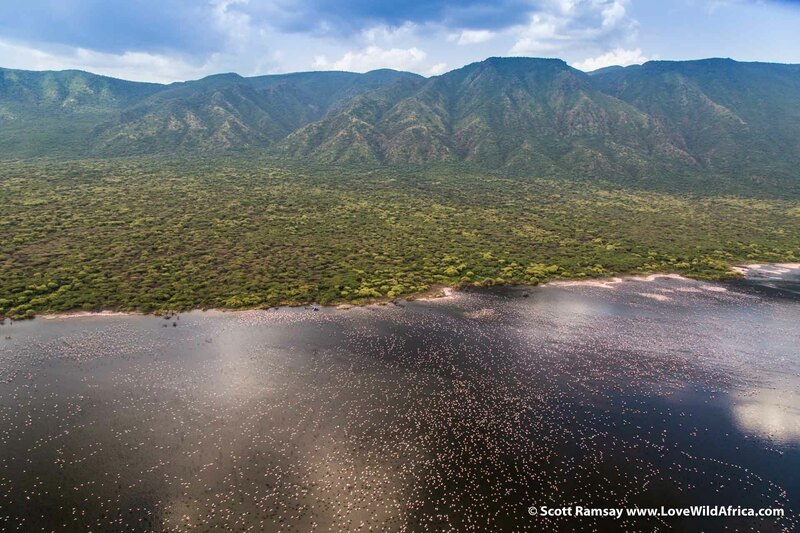 Blue bird and lots of pink birds, over Lake Bogoria. And back into the lush farmlands further south…near to Lake Naivasha. Felt good to be out of the harsh north and back into the bosom of fertile, well-watered lands. 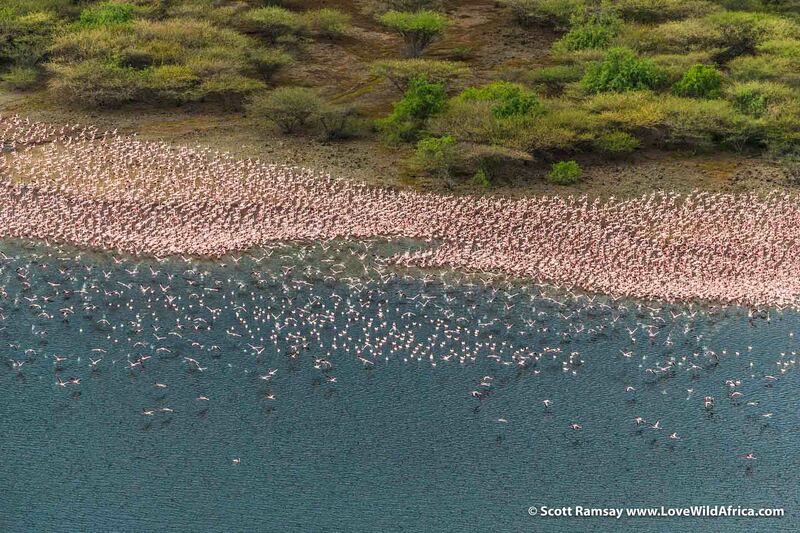 Flamingos on the shores of Lake Elementatia, just north of Lake Naivasha…this truly is a land of lakes. 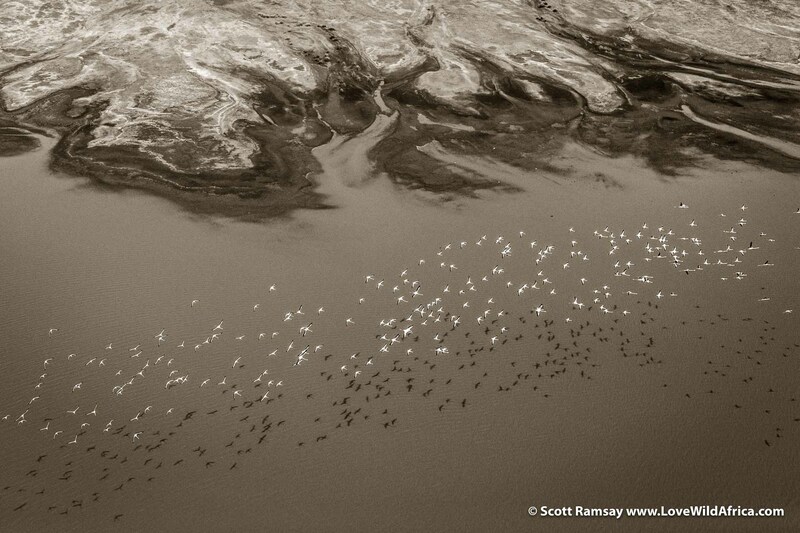 Abstract photo of flamingos…looks more graphic in black and white. Ajabu House on shores of Lake Naivasha, where our helicopter safari ended. “Ajabu” means “miracle” in Swahili…I concur. 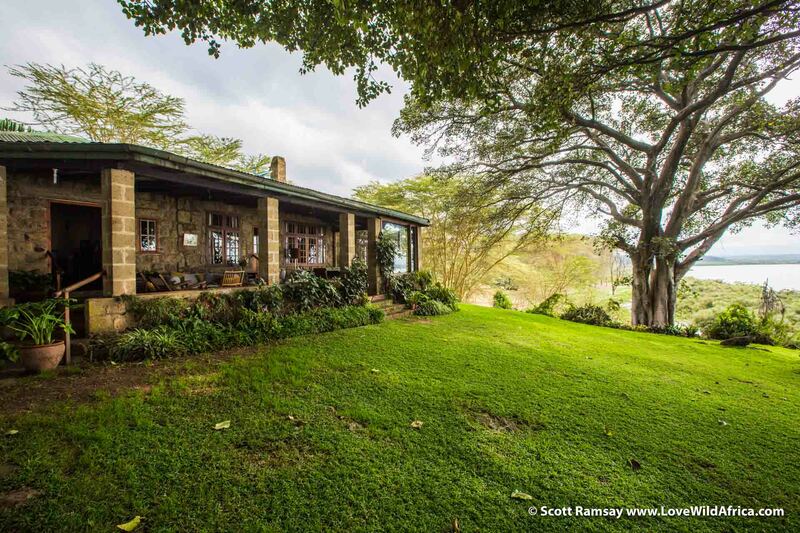 This is the Kenya that most people know…green, well-watered, comfortable and generally lovely to be in. The contrasts between the south of the country and the north are extreme.